10.31.2005 - I received a call about an iguana on the roof of a home. I consider this type of call an "immediate response" situation, because if I do not address the matter immediately, I likely won't have a chance to do so in the future. For example, many snake removals require immediate attention, before the snake slithers off and is lost. However, a case of squirrels living in the attic can wait a day, since the situation will not change day to day. In the case of this iguana, I knew that I would have to arrive quickly, or the iguana would climb down and run off. I am often unable to address these emergency type situations, because I have a full schedule and jobs that require my undivided attention for hours on end. Luckily, I was in the area and with an open schedule, and arrived at this home within twenty minutes. Sure enough, the situation was as described: I saw an iguana on the roof of a home. I raised my ladder, got my snare pole, and climbed up. I had my camera ready, and as I approached the lizard and took a photograph, it started to scamper off. I quickly dropped the camera, and with some deft and nimble snare work, I captured it securely in the noose. It thrashed all about, and I lowered it off the roof and dropped it into a holding cage, as seen in the above photo. How did this animal wind up on the roof? I do not know, but the best explanation is that this iguana was someone's pet, and it was intentionally released. I realize that it could have escaped, but it's more likely that the owner got tired of the animal and "set it free". The problem with doing this in Orlando Florida is that the animal can survive in this climate and potentially breed. Florida is full of non-indiginous, or exotic species. The state prohibits me from relocating exotics, so I brought the animal to a pet shop that agreed to take it. So remember, if you have a pet that you no longer want to take care of, please don't just let it loose. It might become a nuisance animal once it is established in an environment not ready to handle an ecological change. In addition, please keep your pets secure, so that they do not escape. 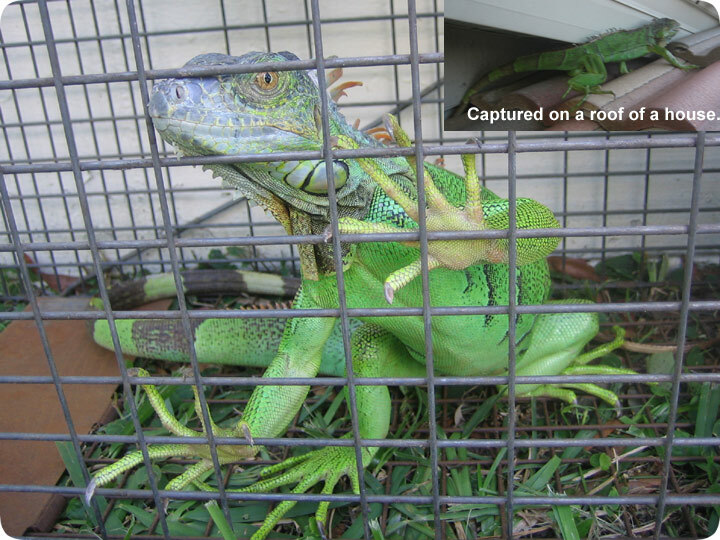 If you happen to spot an iguana on the roof of your home, do not panic. It will probably only eat 33% of your children. My friend Patrick runs a wildlife removal company based in Boca Raton FL. He removes the many iguanas that infest the canals and docks and yards in southern Florida, in Boca Raton and Fort Lauderdale. Give him a call at the below numbers if you need your iguana problem taken care of in Boca Raton or surrounding areas. Do it yourself: Visit my How To Get Rid of Iguanas page for tips and advice.